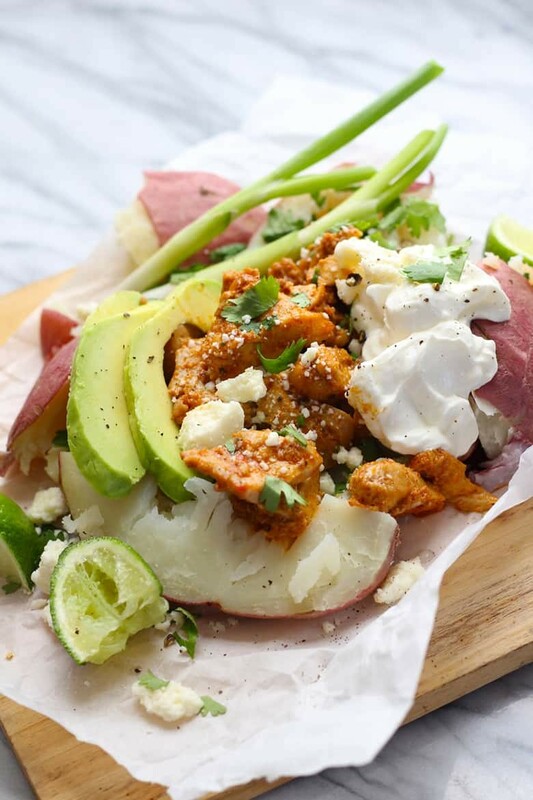 A robust Chicken Tinga is combined with a baked potato for a Chicken Tinga Loaded Baked Potato extravaganza. Treat yourself with this explosion of flavor in our fusion classic where Mexico meets the American loaded baked potato. 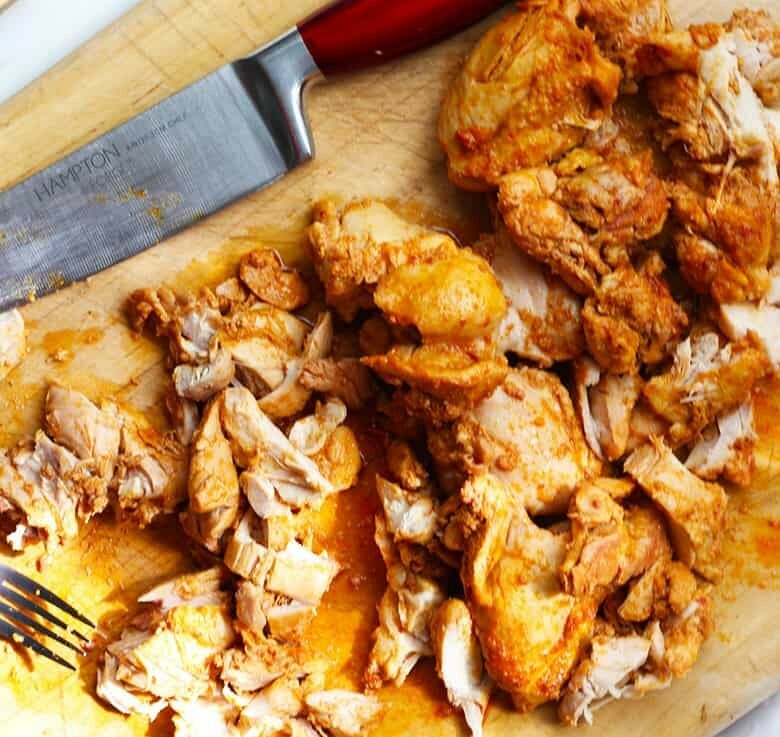 This Chicken Tinga recipe is part of a kinda authentic but easy Chicken Tinga series. 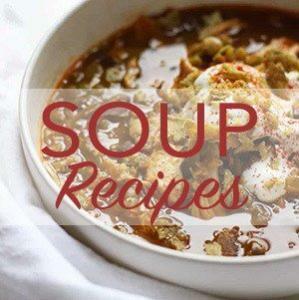 The recipe is incredibly easy and perfect for busy families. You just make a big batch of this two-ingredient taco meat and use all week. What you do with the Chicken Tinga the rest of the week is up to you. I have made tacos, burritos, Chicken Tinga Salad and Loaded Chicken Tinga Street Fries. Chicken Tinga is known as Tinga de Pollo in Puebla, Mexico. It is a taco and tostada filling made with shredded chicken, smoked jalapeños, adobo sauce and onions. 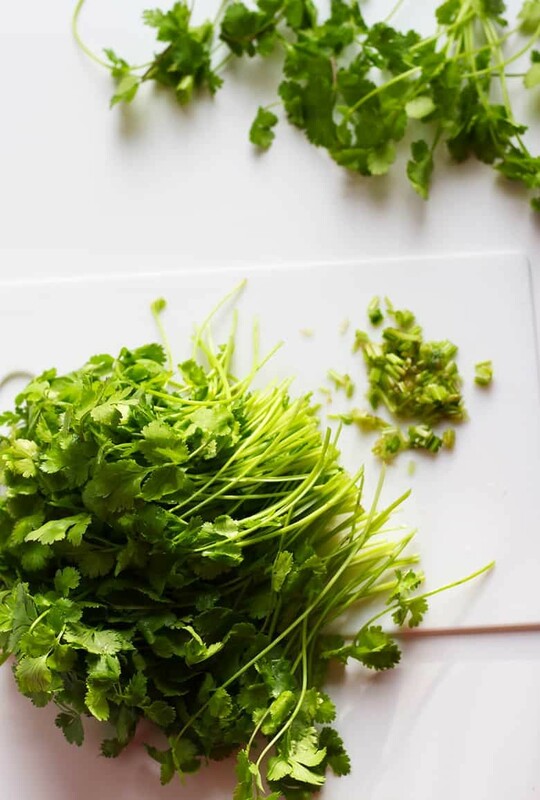 Often it is garnished with available ingredients such as crumbly fresh cheese, green onions, avocado, juice from fresh limes, cilantro and anything else you can imagine. Today we are merging an American classic with a Mexican classic. Diplomacy through good food. 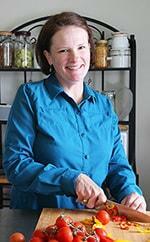 For tips on how to bake a potato, check out this article. Busy weeks are easy peasey with life hacks like this one. 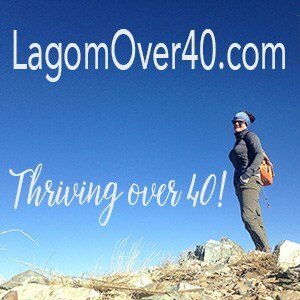 I hope this one is helpful to you like it has been to me. Rub oil on potatoes and prick holes with a fork or knife. Cook potatoes in microwave until fork tender, about 8 minutes on high. You may also bake these in the oven at 375F for 45 minutes or so. Cut potatoes in quarters lengthwise, spread butter on hot potatoes and sprinkle with salt and pepper as desired. Add about 1/2 cup Chicken Tinga per potato and garnish as desired. This is a very versatile recipe. Have fun and experiment with your own toppings. Cheddar and bacon would be sublime, don’t ya think? How about scallions and ranch dressing? Ooh I love a good baked potato, and this fun topping just kicks it up enough to make it a great twist for the whole family. This is exactly the type of dish Hubby and I enjoy. We love our potatoes and chicken is always a favorite. Combine the two in a spicy dish and we will be in heaven. This would make such a great lunch for us!! Pinning the recipe. Loaded potatoes are such an easy dinner option that we always forget about. I love your chicken tinga version. What a fun twist on the typical toppings! I can’t wait to try it! I need like 6 of these baked potatoes right about now! 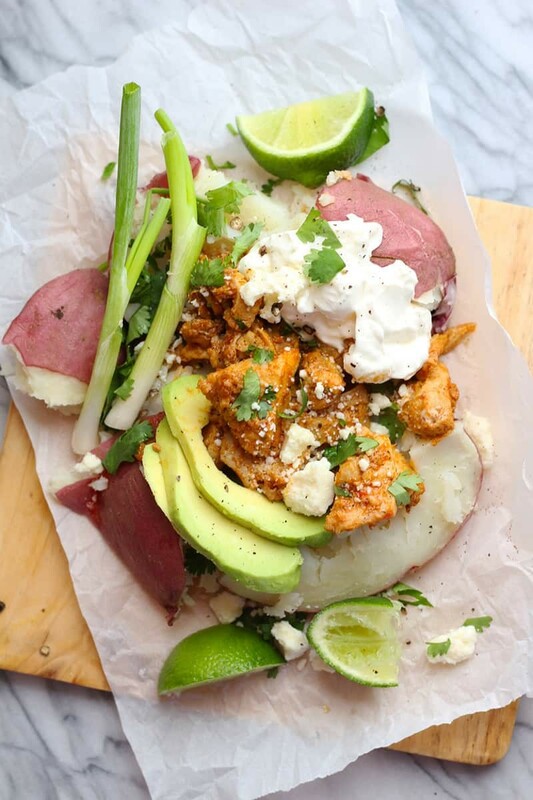 I will never say no to chicken tinga and never say no to a potato so this is a great combination! Your photos are mouthwatering! 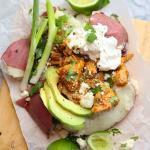 I love how easy this baked potato chicken tinga is to prepare! You are right easy peasy! It a great meal for any night and I would have an extra one for lunch too!